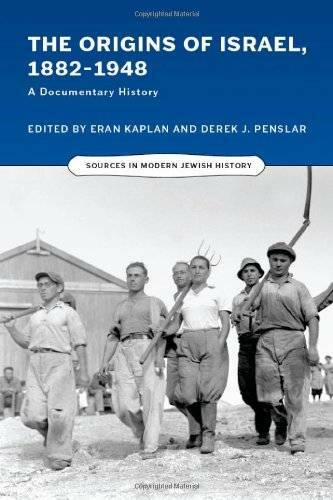 Eran Kaplan, Derek J. Penslar, "The Origins of Israel, 1882–1948: A Documentary History"
In 1880 the Jewish community in Palestine encompassed some 20,000 Orthodox Jews; within sixty-five years it was transformed into a secular proto-state with well-developed political, military, and economic institutions, a vigorous Hebrew-language culture, and some 600,000 inhabitants. 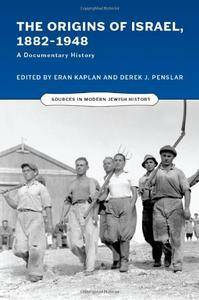 The Origins of Israel, 1882–1948: A Documentary History chronicles the making of modern Israel before statehood, providing in English the texts of original sources (many translated from Hebrew and other languages) accompanied by extensive introductions and commentaries from the volume editors. This sourcebook assembles a diverse array of 62 documents, many of them unabridged, to convey the ferment, dissent, energy, and anxiety that permeated the Zionist project from its inception to the creation of the modern nation of Israel. Focusing primarily on social, economic, and cultural history rather than Zionist thought and diplomacy, the texts are organized in themed chapters. They present the views of Zionists from many political and religious camps, factory workers, farm women, militants, intellectuals promoting the Hebrew language and arts—as well as views of ultra-Orthodox anti-Zionists. The volume includes important unabridged documents from the origins of the Arab-Israeli conflict that are often cited but are rarely read in full. The editors, Eran Kaplan and Derek J. Penslar, provide both primary texts and informative notes and commentary, giving readers the opportunity to encounter voices from history and make judgments for themselves about matters of world-historical significance.